Books have always been an integral part of our family life, from nightly bedtime stories to library trips. And I realized something in the past week or so: Your families love books as much as ours does! I guess I knew this already, but it just flashed at me like a neon sign after I saw your responses to questions on my Facebook page about favorite books. So, let’s share some more! Here are our favorite books this week. 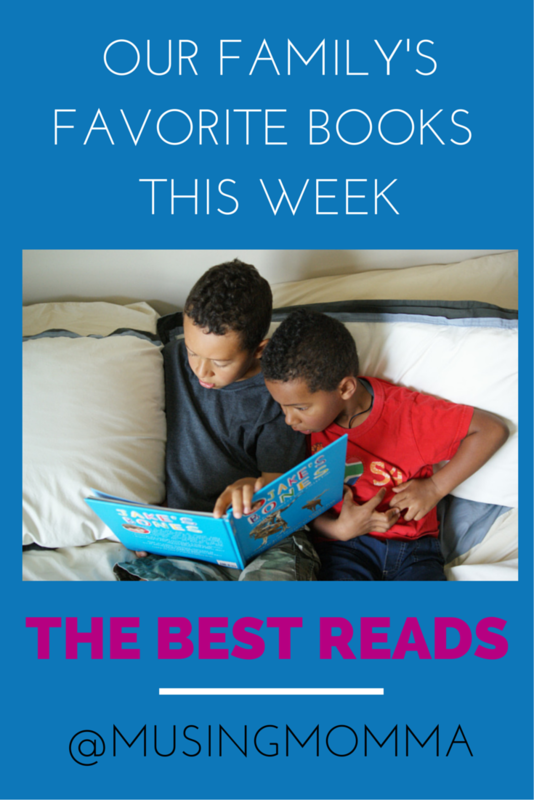 What is your family reading and loving? The gist of the book is that fourth-grader Hank’s meets invisible creature (a bandapat, to be specific…whatever that is) named Inkling who is on a mission to find squash. The book does get into the issue of bullying (Hank is being bullied and Inkling helps him out), and one criticism of the book is that the adults in the story have lackluster or inappropriate responses. So this may be a book parents want to read with their kids and have some conversaton about (while you laugh at Inkling and Hank). When Zip was three or four, a friend brought this book home for us following a trip to Alaska. Over the past few years we have read this book many times, but it is one I never get tired of reading and the boys never tire of listening too. Bee’s synopsis: “It’s about the Iditarod. Granite won three times! One. It is the true story of Granite, an “underdog” who won the Iditarod – that 1,000 mile dogsled race across Alaska – three years in a row. There are wonderful messages about love, determination, and believing in oneself. I fell in love with this book the first time I read it. A little girl, airplanes, and flying pigs – it’s a perfect combination. I love that this book portrays parents outside of stereotypical mom/dad gender roles and that the little girl, Zephyr, is active and imaginative and smart. The premise of the book is that, after being sent to her room for flying paper airplanes in the house, Zephyr is sent to her room where she discovers a door to an imaginary world. In this world which is inhabited by flying pigs, Zephyr meets a little pig who can’t fly. And what does a budding aviator do in this situation? Helps him fly, of course. There you have it – our favorite books this week. Happy reading!